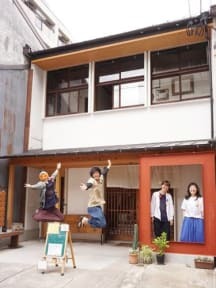 B&C Gakubuchi is located in the center of Hakata, and access to Hakata station, a Nakasu and Tenjin is very easy and convenient for sightseeing! Our café and Bar at 1 floor is the area to enjoy communication with Japanese local people and travelers. We are waiting for everyone's coming pleasantly. From the subway Gofuku-machi station, only 2 minutes on foot. From Tenjin station and Hakata station, 5 minutes by bus. From Fukuoka Airport, about 20 minutes by subway. 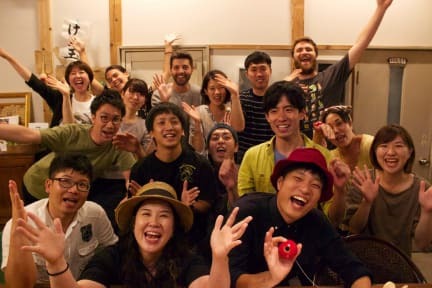 ☆Our café and Bar have tasty liquor form Kyushu and also this is the space Japanese local people and travelers will get together, so you can enjoy drink and communication. ☆ If you like to be alone and chill out, we have the common area called Madobe where you can relax at second floor. You can spend comfortable time. ☆ A welcome drink is being prepared when you have check-in. A friendly staff provides more sightseeing information by a homemade map, so you can enjoy if you have No plan! ☆ A free Wi-Fi can be used at the whole field in the building in B&C Gakubuchi.